TLC® "Amore™", Art. E515 (6 ounce solid/4.5 ounce multicolor skeins). Knitting Needles: 5mm [US 8]. Yarn needle. GAUGE: 28 sts = 5 ¾"; 22 rows = 4" in pat. CHECK YOUR GAUGE. Use any size needle to obtain the gauge. Scarf measures approximately 5 ¾" x 62". Yarn Amount: 4.5 Ounces No. 3934 Plum Print. Cast on 28 sts. Marking first row as the right side, work in pat as follows: * K1 , P1; rep from * across. Rep last row for pat until 62" from beg or until all but 1 yard of yarn is used up. Bind off loosely in pat. Weave in ends. 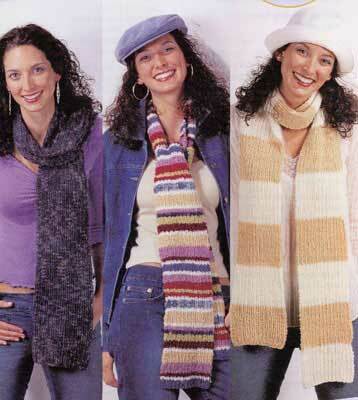 Scarf measures approximately 5 ¾" x 78". Yarn Amount: 3 Ounces each No. 3103 Vanilla and 3220 Wheat. With Vanilla, cast on 28 sts. Marking first row as the right side, work in pat as follows: * K1 , P1; rep from * across. Rep last row for pat and work * 24 rows with Vanilla, then 24 rows with Wheat. Rep from * until 9 stripes of each color have been worked. Bind off loosely in pat. Weave in ends. Scarf measures approximately 5 ¾" x 70 ½"
With Lake Blue, cast on 28 sts. Marking first row as the right side, work in pat as follows: * K1 , P1; rep from * across. Rep from * 5 more times. Bind off loosely in pat. Weave in ends. ABBREVIATIONS: beg = begin(ning); K = knit; mm = millimeters; p = purl; pat = pattern; rep = repeat; st(s) = stitch(es); * or ** = repeat whatever follows the * or ** as indicated.